Write about beer? Live in North America? Be recognized! Enter NAGBW competition. There once was a North American Guild of Beer Writers. Begun in the 1990s, it closed its books in 2003. Now, the NAGBW is back, reconstituted through the efforts of Lucy Saunders, Jay Brooks, Don Russell, Stan Hieronymus, and other writers. The first three convened the Guild's's inaugural meeting at the 2013 Craft Brewers Conference, in Washington, D.C.
We are professional beer writers. We make our living, or at least a substantial portion of it, writing about beer and brewing. We are authors, writers, publicists, bloggers, columnists, critics, cheerleaders and more. We tirelessly cover the brewing industry and those who appreciate beer across North America. Many of us are self-employed or do this as a side 'gig' in addition to our 'real jobs.' Some of us are employed by breweries, beer distributors, beer bars, stores, and restaurants. Still others are publishers and event organizers, while some work for newspapers, websites, magazines and other media outlets. 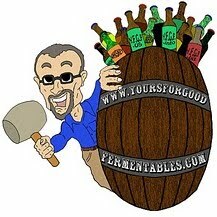 We are an all-volunteer group dedicated to elevating the level of our craft as we cover the art of brewing. We are serious in our purpose, but strive to enjoy ourselves in doing our jobs. One of the NAGBW's initial goals has been to create an annual writers' competition to help foster awareness and appreciation of writing about beer and brewing in North America, in-print and on-line. It's been done. Here's the press release. The North American Guild of Beer Writers announces the launch of its annual competition for writers, bloggers, broadcasters, and authors. As of 2013, there are more than 2,500 breweries in existence with many new breweries and brewpubs in planning across the United States. When Canada is included, that number climbs even higher. Yet many media outlets in cities and towns of all sizes still do not regularly cover craft beer or brewing in their local newspapers, magazines or radio stations. 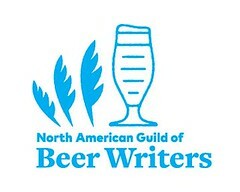 With the formation of the North American Guild of Beer Writers (NAGBW) and an annual writing competition, the NAGBW aims to broaden the conversation about beer and brewing, raise the standards of writing, provide leadership and continuing education for practitioners of our profession while also encouraging and supporting more participation throughout all media channels. The annual writers competition is now accepting entries, at submittable.com. NAGBW’s awards honor the best beer and brewing industry coverage in seven categories. Deadline to apply: August 26, 2013. UPDATE: Winners announced. Beer writing/broadcasts dated between July 1, 2012 – June 30, 2013 are eligible. Online submissions are being accepted here via submittable.com, including books in PDF format. Large files are accepted. If your book is only available in print, please fill out the entry form online, using a letter with shipping info to notify that the books are being shipped. Please send 2 copies of books with a copy of the completed submittable form to Lucy Saunders. The new Guild has members from USA, Canada, United Kingdom and Costa Rica. Guild membership is open to all writers and content producers who cover beer and brewing, although industry and associate memberships are both non-voting categories. For more information, visit www.nagbw.org. Co-chairs: Jay Brooks, Don Russell.